The Rocks are in the second qualifying round of the FA Cup following a comfortable 5-1 victory at home to Guildford City. Five different players scored as Bognor made in ten goals in a week in front of their own fans. 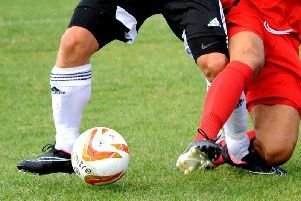 The Combined Counties League premier-division side battled well but did not have the quality to contain Jamie Howell’s side. A fantastic start to the season has earned the Rocks the Ryman League’s Macron Performance of the Month award for August. Bognor were without Thomas Byrne, who was away with Ireland under-18s, while Chad Field, Doug Tuck, Sami El-Abd and Harvey Whyte were all injured or being rested. The Rocks got off to a great start when Jimmy Wild’s neat touch and turn saw him square it across the area and after Ollie Pearce had his attempt blocked, it was the in-form James Fraser who netted low below goalkeeper Jordan Clement just two minutes in. At the other end Perry Coles crossed and Ibby Akanbi’s instant shot flew back to him. Youssef Bamba went to ground but it his claims for a penalty were ignored. Darren Budd’s chipped pass towards Pearce was defended on 13 minutes, then Pearce’s shot from 25 yards was blocked. Fraser’s pass found Wild and he was tripped by Martin Dynan just outside the area on 18 minutes. Budd stepped up to curl the ball high into top corner to give Bognor a 2-0 lead. Walter Figueira’s low pass into the box was skied over the bar by Pearce. Bobby Dormer slammed a low shot from way out that was easily gathered by Billy Granger on 23 minutes before Matt Glass’s attempt also flew wide. Pearce’s corner was headed towards goal by Gary Charman and the rebound fell to Wild, who forced Clement into a parried save. Budd followed this with a strike over the bar on the volley. Bognor went further ahead on 31 minutes. Pressure on the right saw James Crane cut inside and shoot low into the bottom corner beyond the goalkeeper. Wild almost latched on to a Clement spillage from a long pass but the goalkeeper gathered the loose ball - just. Figueira hit a deflected shot wide of the post. Charman was blocked at the corner. A ball down the left for Dylan Barnett saw him speed away and cross low into the box. Pearce got there before the defenders but went to ground and Guildford cleared. Wild found Pearce and he tried to chip the goalkeeper but the visiting No1 stopped it. Guildford did threaten at times and, following good work by Akanbi, Coles chipped the ball over Granger on 42 minutes to make it 3-1 at the break. Marcel Henry-Francis replaced Harry Mills at half-time for the visitors. Glass’s free-kick was struck wide on 47 minutes before Henry-Francis shot only just wide from the edge of the box. Dan Beck received a yellow card for Bognor after an ill-timed challenge on Darryl Siaw on 53 minutes. Bognor extended their lead on 55 minutes. Pearce laid the ball off to Wild, who made good headway into the box before poking the ball low into the net. Dormer received a yellow card on 60 minutes for a late challenge on Barnett. Alex Parsons came on for Fraser on 61 minutes while Shawn Clement-Peter replaced Dormer for Guildford on 65 minutes. Coles shot over the bar on 69 minutes and Guildford never gave up. Parsons netted Rocks’ fifth. A neat cross by Pearce from the left found him near the back post and he slammed the ball in off the goalkeeper from close range on 72 minutes. On 73 minutes, Figueira was replaced by Jimmy Muitt. A Parsons cross had to be pushed away and then Crane’s low shot was defended. Tom Booth replaced Dynan for the visitors and Will Robinson came on for Beck on 77 minutes for Bognor. Bamba smashed the ball against the rpost with a curling effort from the left on 79 minutes. Then Granger palmed another attempt over the bar from a Coles chance. The Rocks struck the bar, too, with a shot by Wild on 85 minutes. Substitute Charlie Bussetti’s dipping shot had to be saved by Granger on 86 minutes as Charman was announced as the sponsors’ man of the match. Pearce smashed another shot which brought a fine save from Clement. The next round of the FA Cup takes place on Saturday, September 17, and the draw is on Monday. Rocks: Granger, Crane, Barnett, Budd, Charman, Sanders, Fraser (Parsons 61), Beck (Robinson 77), Wild, Pearce, Figueira (Muitt 73).